The Antarctic Chieftain is a fishing vessel co-owned by Talleys and the Sealord Group. Brightwater was contracted in 2015 to undertake repair and maintenance work on the vessel which was damaged by ice during operations in Antarctica. 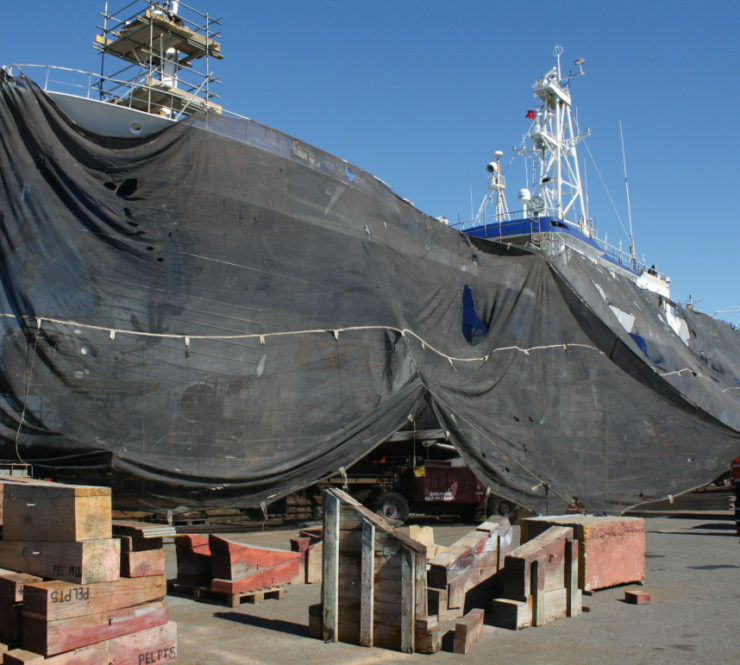 Brightwater was tasked with repairing a seven meter by three meter area of damaged hull plate. The repairs involved cropping the damaged section and replacing it with a new heavier section and the repair and replacement of sections of the ships frame including ships ribs. The original hull plate was 12 millimetre thick and this was replaced with thicker 16 mm thick steel plate. The work included confined space work and all the repairs were undertaken by our certified welders using Brightwater weld procedures and all repairs were surveyed following the work. The entire job was expected to take two weeks. The Brightwater team completed the task in under ten days, in order to achieve this two on site teams of 5 tradesmen worked around the clock with alternative day and night shifts.